Contrary to what your uncle says, making sushi is much more than plopping a scoop of canned tuna on some seaweed and calling it good. It's a discipline that requires precision, creativity, and tradition. If you're ready for a short board that melds a big mountain pedigree with ultra-quick maneuverability, belly up to the bar and order the chef's choice, the Rossignol XV Sushi LF White Label Snowboard. Made for slicing, dicing, and gee-this-feels-nice-ing, this is a board for deep days in tight Japanese trees. 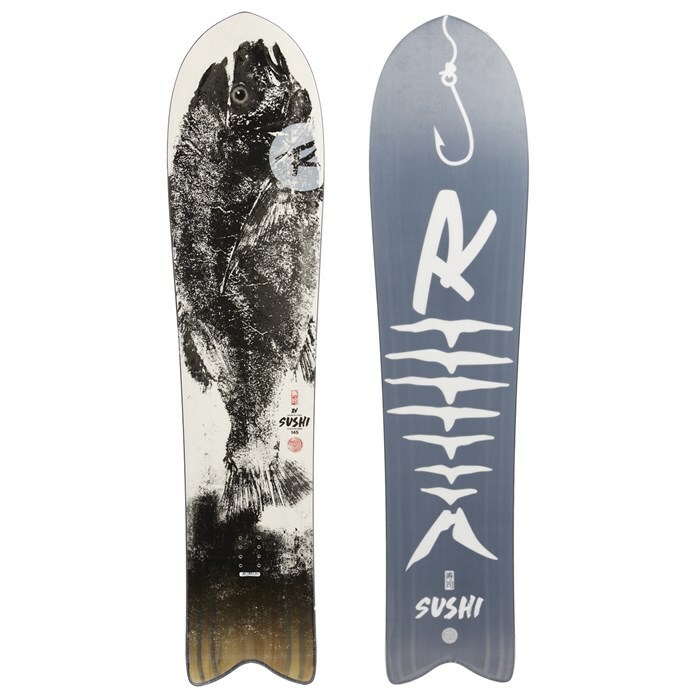 AmpTek Elite Rocker  With 30% rocker at the nose, 60% camber at the insert packs, and 10% rocker in the tail, this board floats in deep snow and has the bite to hang on in heavy carves. Reverse Directional Flex  Stiffer under the front binding for deeper snow feel. TPU  Thermoplastic polyurethane is an elastic material that performs well at low temperatures to dampen vibrations and increase board strength. L.I.T.E. Grip Technology  Lite Grip technology brings a whole new type of edge control to the snowboard world. Rossignol designed the urethane to bend away from the sidewall at specific places providing extra edge-hold in technical or icy conditions. Limited Edition Early Release  Only 50 boards produced! Freeride Freeride snowboards are designed for the rider that spends most of the day off groomed runs and in backcountry terrain. They typically have a stiffer flex and are ridden in longer sizes than freestyle snowboards. Freeride snowboards often feature a directional shape that is designed to perform optimally in one direction. Powder Powder snowboards love powder. Often associated with freeride snowboards, powder boards sometimes feature a wider nose and a tapered narrower tail. The binding inserts, which determine the rider's stance, are often set back on a powder snowboard to help the rider float the tip of the board through the deep stuff. Powder snowboards sometimes also feature rocker, a design element where the tip (and tail) rise starts farther back on the board, which also helps the rider maintain tip float through the pow.